Lavagh More has a very large presence in the Reelin river valley, from where i have climbed it on several occasions, this is due to its separation from the long central ridge by the deep Struell Gap.I have tended to reach it as part of the route starting at Glascarns Hill and following the high ridge to the summit of Croaghgorm, before dropping down into the high Struell Gap (939904 D). 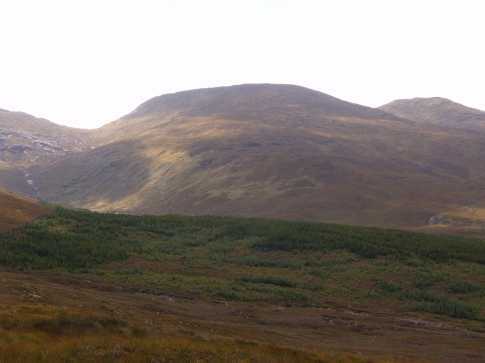 A succession of walking posts head through the gap on their way steeply downward, whereas the summit area of Lavagh More is a steep ascent of 15 minutes over good ground. 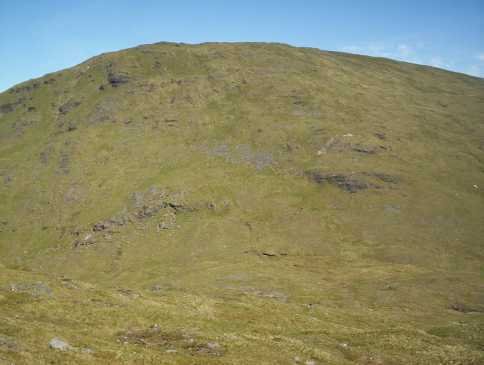 There are a few rocky areas with small scree beneath but generally the slopes are of grass. 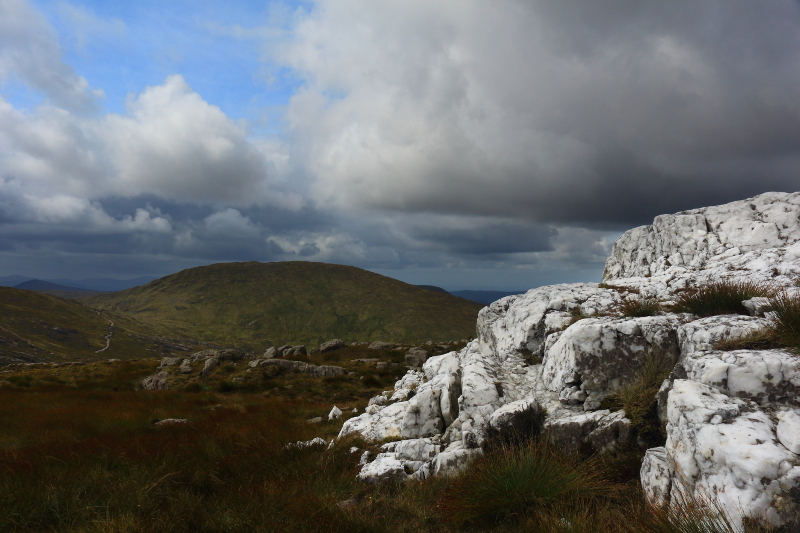 When leveller ground is reached can take time to look back and appreciate the views to Croaghgorm and the length of the Bluestack ridge which have just walked. A short walk brings the first of two summit cairns, the top being blessed with a number of small pools of water in between. 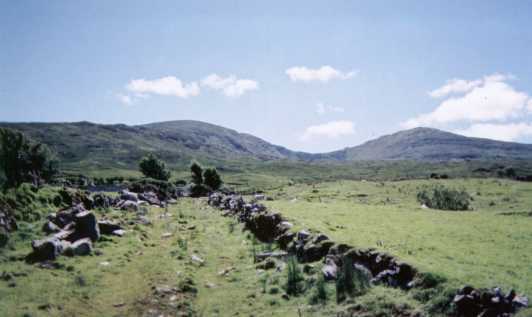 The views are far reaching - to little sister of Lavagh Beg and past Silver Hill and Carnaween to the end of the range, up to the Derryveagh mtns and out to sea past Maghera, Slieve League to Donegal Bay and the hills of Sligo. 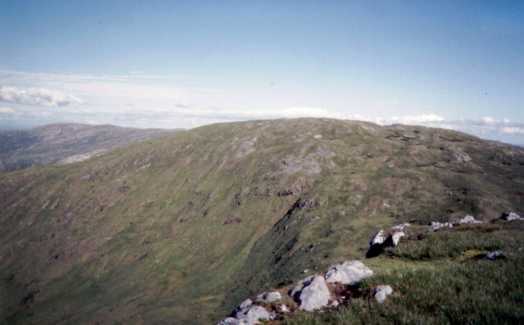 To finish the circuit of the high Bluestacks it is a short drop down to the col and an equally short climb to the summit of Lavagh Beg. I have also climbed up from Croaghanard Lough, along the NE spur, but this was on a day of mist and drizzle and midges so it did not endear me - though the weather did clear on the summit and offered the views already described and provided an excellent camping spot. I reached Lavagh More having already walked Ardnageer, Ardnageer SW Top and Croaghgorm, and virtually climbed Croaghbane and Glascarns Hill too at the start of the walk, although I turned west just shy of those two summits having done them before. It had been a long walk, and as I stood on Croaghgorm, Lavagh More looked formidably high, and incredibly steep from this angle. The drop down from Croaghgorm took its toll on already sore knees, and the climb up to the summit, although maybe not as big as it had looked, was indeed steep, requiring the use of hands at many points. 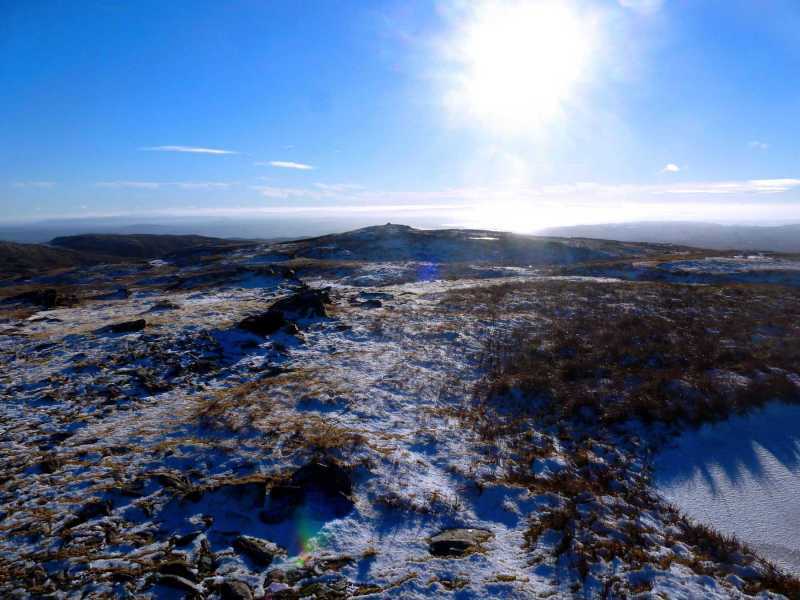 I was relieved to reach a cairn marking a minor summit as the slope levelled out near the top, and it was a short walk from there to the highest point, also marked by a cairn, across gentler slopes. I had great weather for most of the day, but it had now turned wet and gloomy. As a result, the photo is one taken of Lavagh More from the white quartz mound near Ardnageer SW Top earlier in the day. The murky conditions didn't lend themselves to photography, but I could still appreciate the extensive views, particularly towards Slievetooey, Slieve League and Donegal Bay.